If you are setting up the application for the first time this page will appear blank, otherwise it will have a list of your company’s roles in the order that they were created. Select the “ADD NEW” button at the top of the page to create a new role. First enter the role, a description of that role and the status. Then select the respective permissions within the application to be associated with that role, a list defining each permission is available in the description. Finally select “ADD NEW ROLE” to create the role. Roles can be edited or made inactive by selecting “Edit” from the “Manage Roles” page and updating the role properties. For additional support please contact your account manager or email support@performancescoring.com. Score Users: The role will have the ability to score other users. Login: The role will have the ability to log into your company’s Performance Scoring application. Add Scorecard: The role will have the ability to add new ScoreCards. View Scorecards: The role will have the ability to view Entries in ScoreCard Categories in which they have permission to score in. View ScoreBoard: The role will have the ability to view the ScoreBoard for themself and their reporting users. View FactorBoard: The role will have the ability to view the FactorBoard for themself and their reporting users. View Profile: The role will have the ability to view their profile within the organization’s Performance Scoring Application. Edit Profile: The role will have the ability to edit their’s and other’s profile within your company’s Performance Scoring Application. View My Score: The role will have the ability to view their My Performance Score. Bulk Employee Upload: The role will have the ability to bulk upload/update/import employees. Manage Users: The role will have the ability to add and edit other users. Manage Factors: The role will have the ability to create and edit factors in ScoreCard Categories in which they can score. 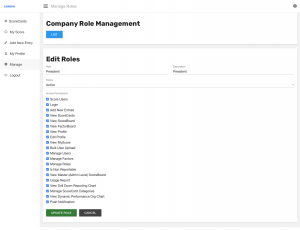 Manage Roles: The role will have the ability to create and edit roles. Is Non-Reportable: the role is not able to be scored. View Master (Admin Level) ScoreBoard: The role has the ability to view the entire organization’s ScoreBoard with every active ScoreCard Category. Usage Report: The role will have access to reporting users usage reports. View Drill Down Reporting Chart: The role will have access to the drill down reporting chart in the ScoreBoard. Manage ScoreCard Categories: The role will be able to create, modify, and make active/inactive ScoreCard Categories. View Dynamic Performance Org Chart: The role will have access to the Dynamic Performance Org Chart, showing all reporting users. Push Notification: The role will have access to setup push notifications for reporting users.